Its release date is drawing steadily closer and we’re continuing to see new details emerging about what the Nintendo Switch can do. The latest news is that the system will support a wired LAN mode for local multiplayer gaming, something we haven’t seen from Nintendo since the GameCube. The feature was revealed as part of the announcement of a Splatoon 2 Global beta test event that will be taking place in March. Called LAN Play, the mode will allow up to ten docked consoles to connect via wired LAN for local multiplayer tournaments without the need for an internet connection. Though ten systems will be able to be connected, the mode will support a maximum of eight active players, as two of the systems are limited to being used as spectator screens. According to Nintendo, though local wireless play “is perfect for your regular gaming get-togethers” LAN Play “is where it’s at when you want to organize a serious tournament event with your fellow players." Anyone that’s pored over the console’s various ports already might be surprised to see this mode exists as the Nintendo Switch doesn’t actually have a standard Ethernet port like other mainstream home consoles. That means you’ll need to get your hands on a USB-to-Ethernet adapter for each of the consoles you want to connect. There are officially licensed versions, but if you already have one there doesn’t seem to be any reason why it shouldn’t work, although we're looking forward to trying it out ourselves when we have a console for ourselves. 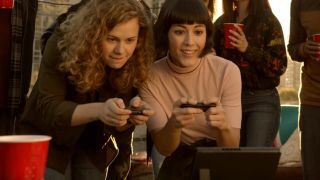 If this seems like a touch too much fuss, you’ll still be able to connect with other consoles via a wireless LAN connection when the Switch is in its portable mode. This will still support eight players, though you won’t be able to get the two spectator screens that the wired LAN connection offers. This does, of course, only solidly confirm that Splatoon 2 will support up to ten docked consoles for wired LAN play. Whether or not other multiplayer games such as Mario Kart and Super Smash Bros will support more than ten systems or even wired LAN play at all has yet to be confirmed.